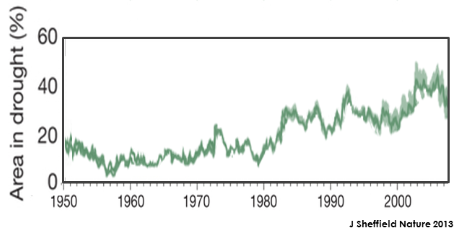 The dryness and drought trend standard measure is the the Palmer Drought Severity Index. 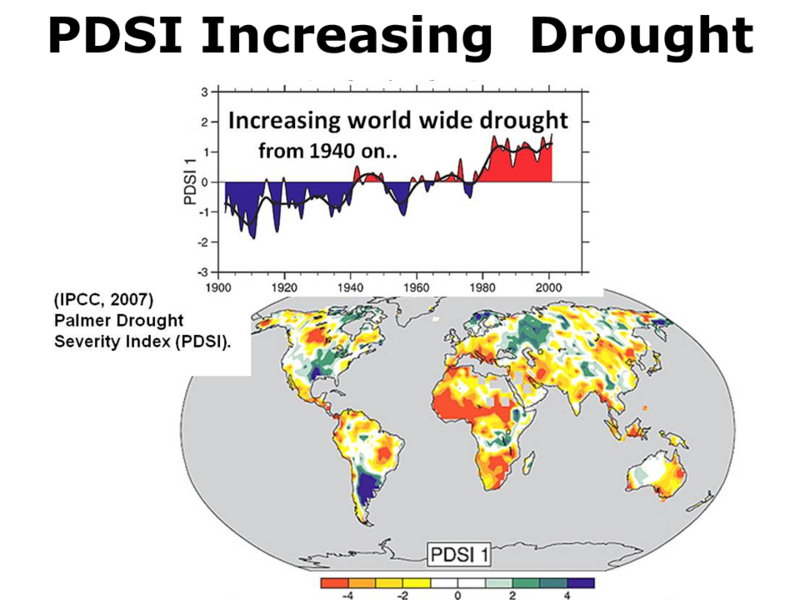 The 'Increasing Drought' map shows the global PDSI from 1900 to 2002. 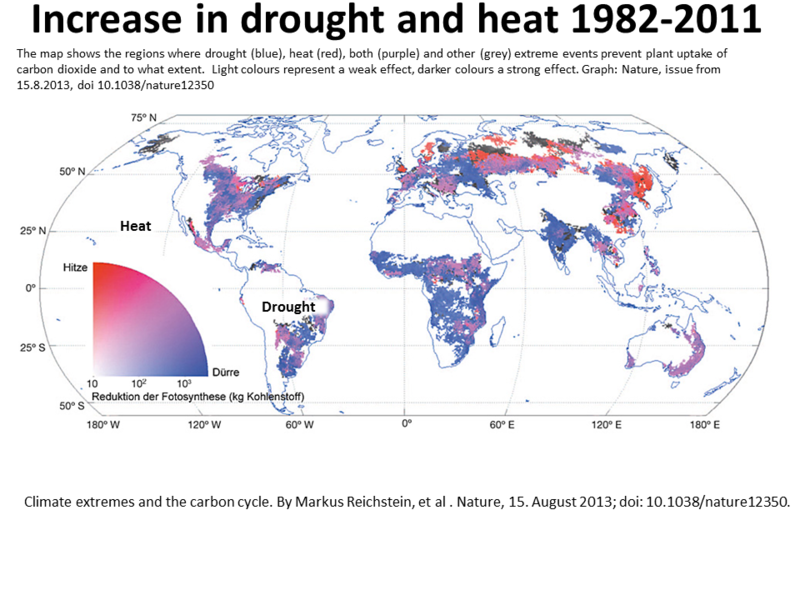 For most areas, drier (red and yellow) conditions have progressively increased over the century with a huge jump from 1880 to 1985. 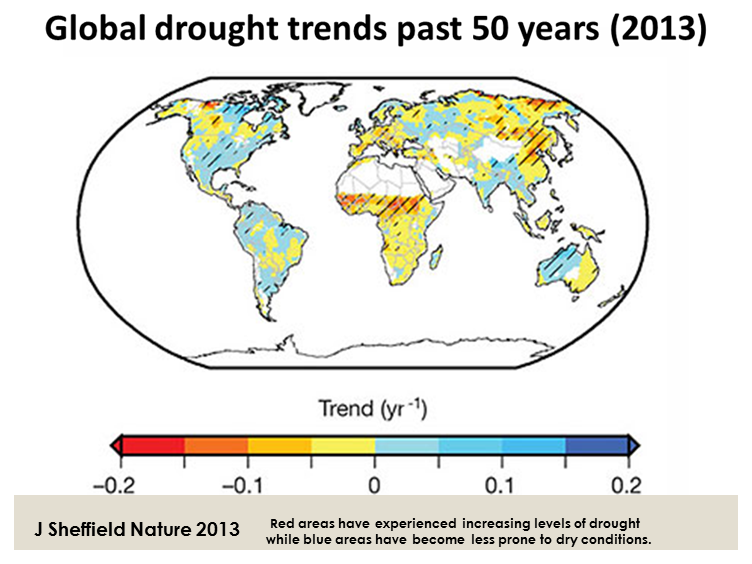 ​​The bottom figure shows the trend over time of increasing drought, indicating that for much of the world, droughts are more common. (IPCC 2007​​). The PDSI is being questioned to assess drought under climate change because it may overestimate area increase. 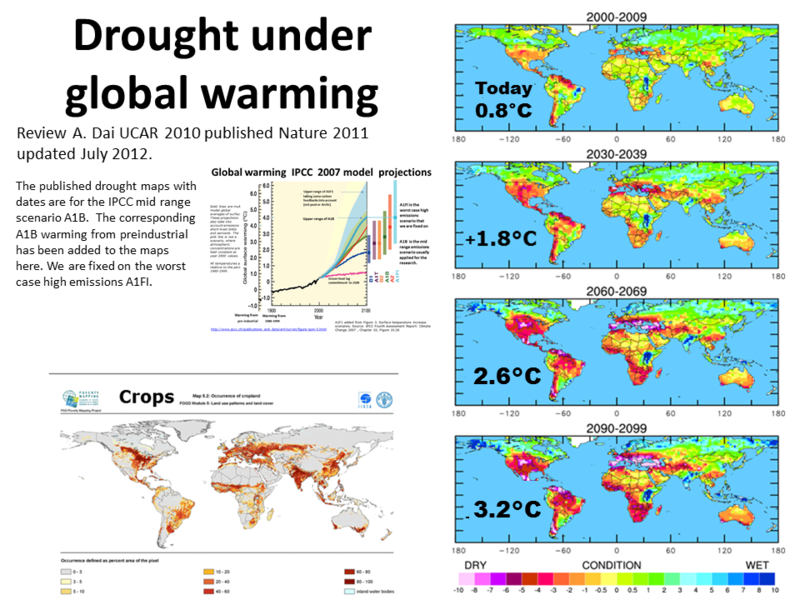 UCAR site of research by A Dai​ The drought projections affect all the world's best food producing regions. At 1.8C severe drought affects all the world's food producing regions. 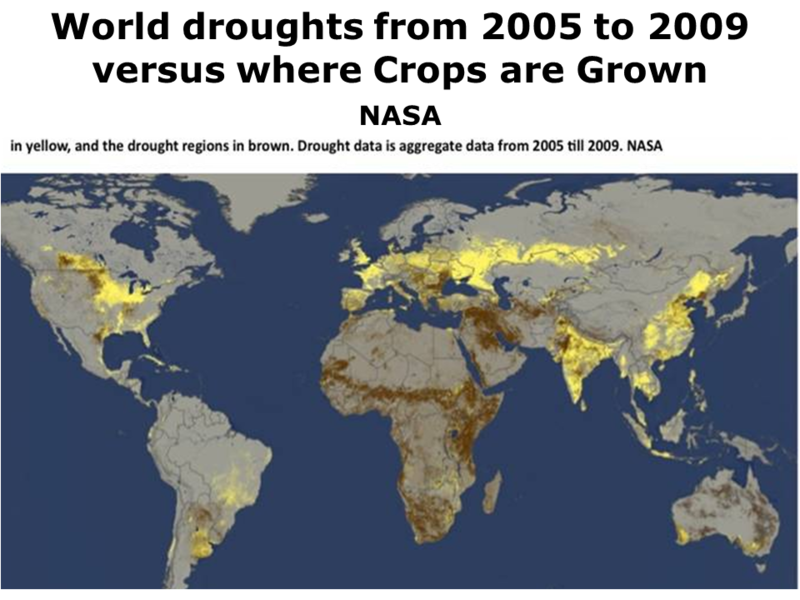 Increasing drought affecting the world's best food producing regions in the Northern hemisphere threatens world grain reserves and world food security (Center for Climate and Security). 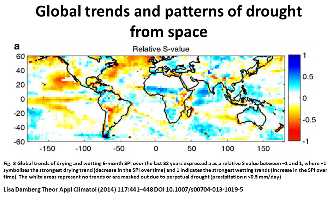 Nov 2013 K Trenberth A Dai ​​Global warming and changes in drought shows a global drying trend 1980-2010, future drought will set in faster and be more intense. 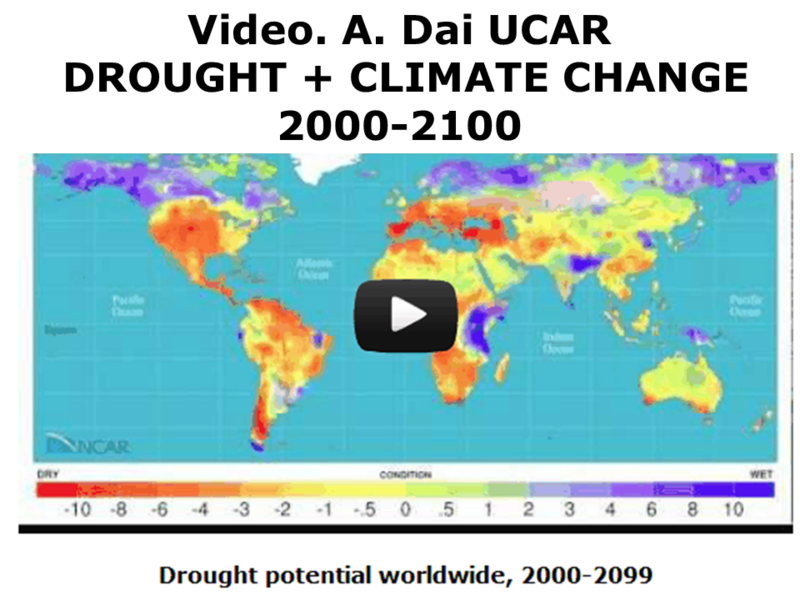 ​​A Dai (UCAR) is the top world expert in drought modeling past and projected global drought. Remember we are already locked into a warming today's 2-3X today's 0.8C because of the climate change commitment. 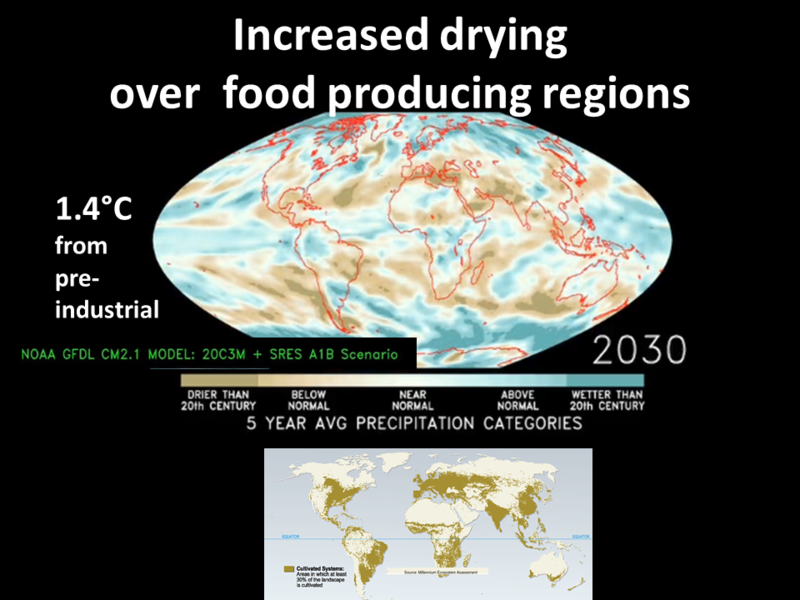 ​​Global warming induced drying is projected by models to affect major food producing regions as increased precipitation moves towards the poles . While drought occurs in Summer, Winter rainfall is important because it replenishes water sources. Since 2000 extreme heat and drought has affected US and other Northern hemisphere food producing regions, affecting Western Europe. Extreme NH drought has affected Western Europe, Russia, USA, China and India. 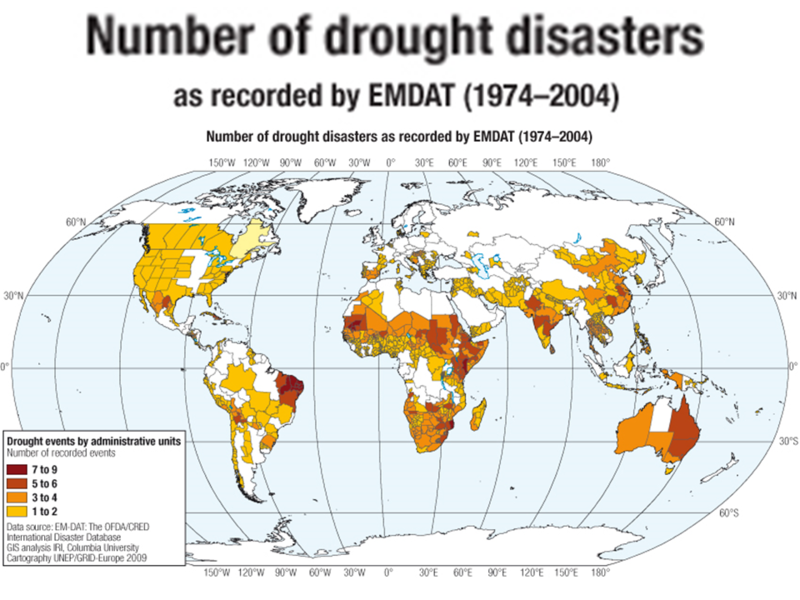 Drought Is Increasing - more than doubled world wide according to A. Dai 2010. 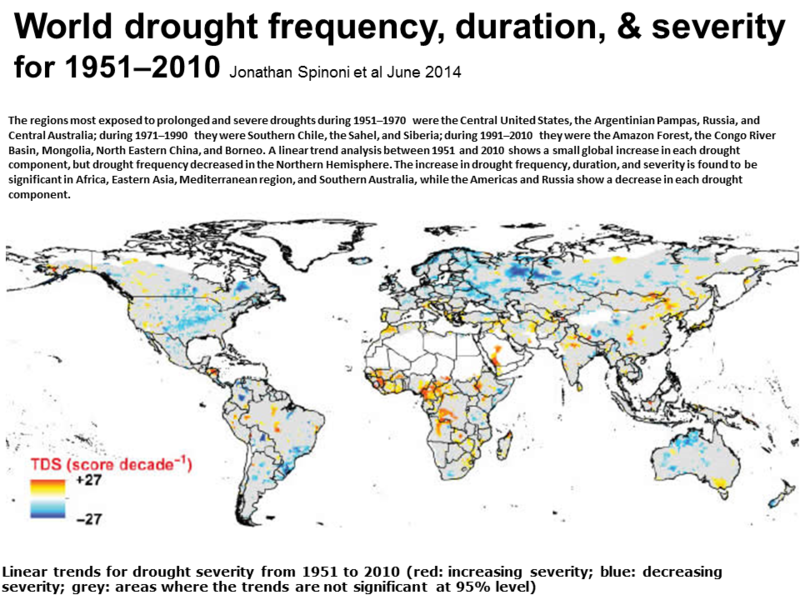 However since 2012 the science on how much global drought has increased has been questioned. 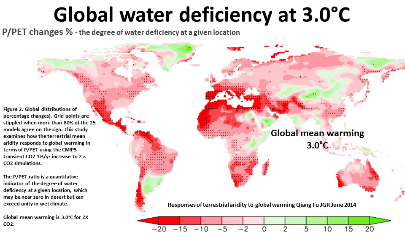 The most recent paper is by A Dai 2012 and revised who upon review finds observations and models show world drought is increasing under global warming. While we think of drought being a summertime event winter drought also matters. 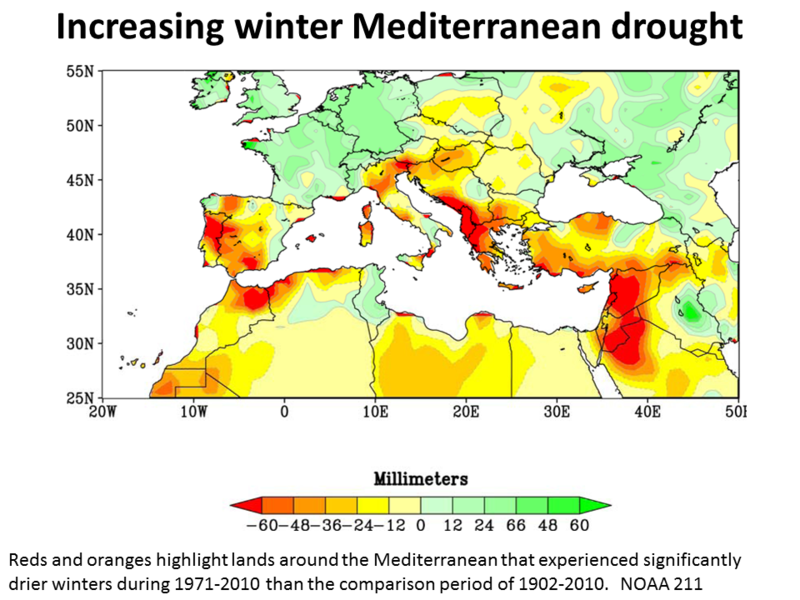 In 2011 NOAA ​​reported that dangerous wintertime drought was increasing around the Mediterranean. 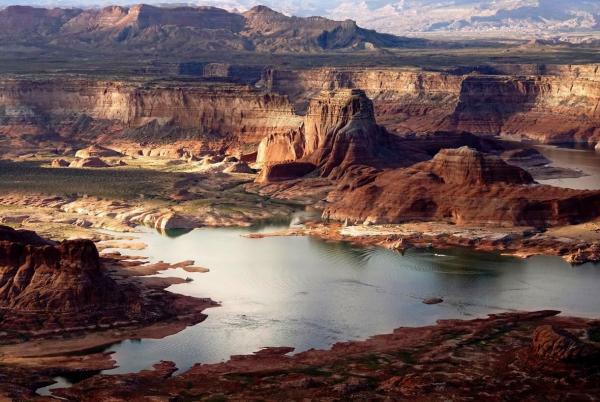 Drought, which is water shortage, can be defined in a number of ways. It will continue to increase ​as global warming continues and global temperatures increase. 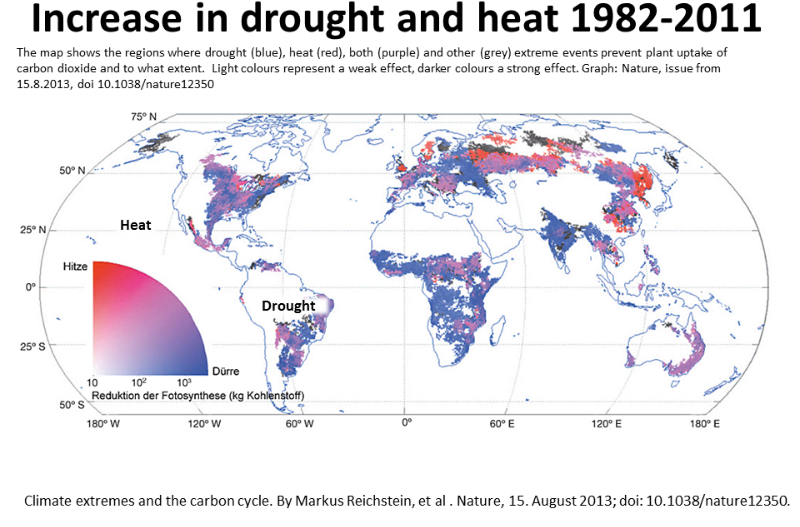 Global warming related increased drought affected the temperate NH late 1990s and early 2020s. ​Over the past few years it looks like ​​Northern hemisphere drought is increasing, affecting all the world's best food producing regions. The rapid loss of Arctic cooling snow and ice albedo cooling is projected to increase N. hemisphere drought, so may now be a factor. 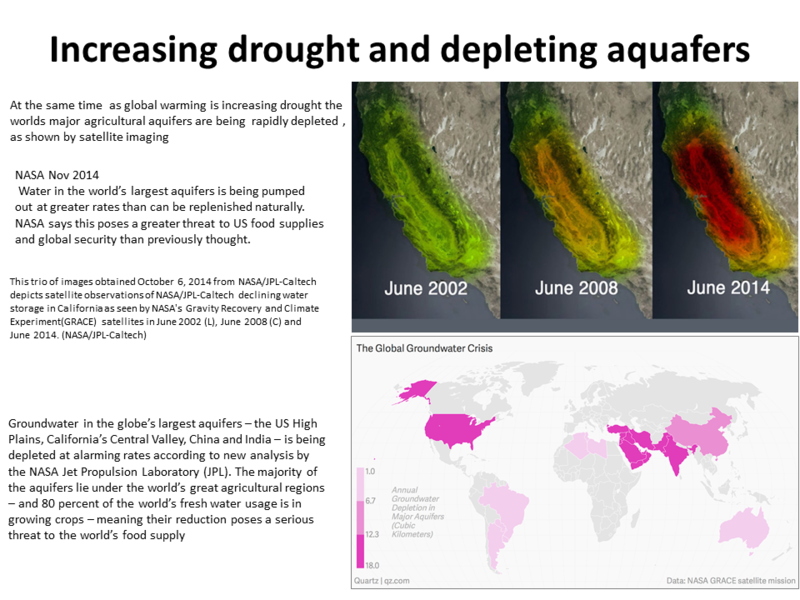 Drought is damaging of course the human population health by lack of water and increase in diseases. In past droughts - millions have died. This will greatly increase the effect of climate change induced food losses to human health and survival shown by the climate crop models . The world's most productive agricultural region is the US Great Plains called the world's breadbasket which stretches up to Canada. This region has a recent history and a far distant history of natural vulnerability to drought, and suffered a major drought in 2006. 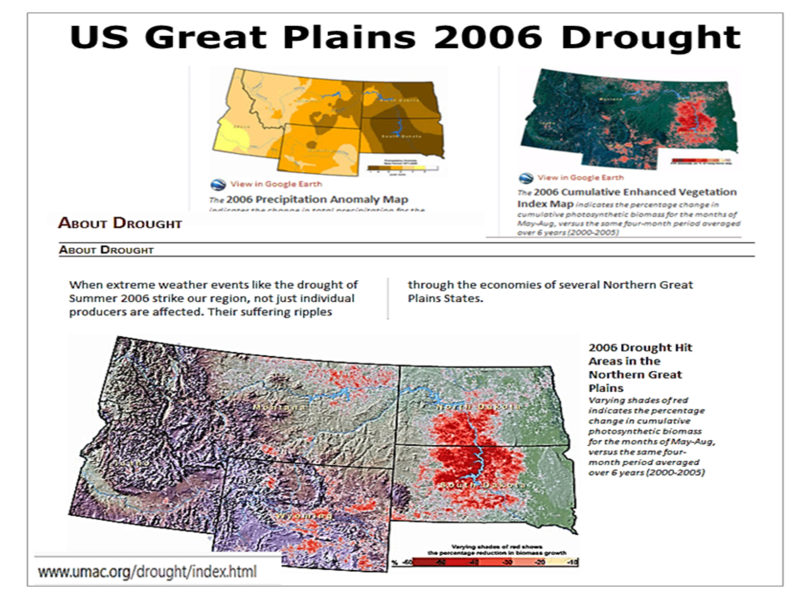 Climate change is projected to increase plains drought (USGS). The NOAA North American Drought Monitor covers this region. For current US drought check US Drought Portal. 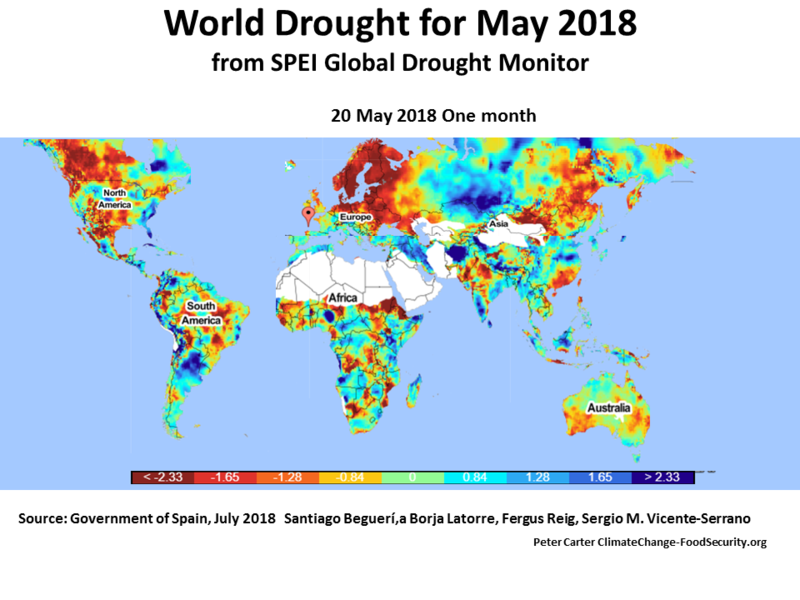 Both (model) projections indicate Southern Europe, North Africa, Mexico, the Caribbean, and a large portion of the United States and Canada will likely to suffer dramatic increases in the incidence of drought. April 29th, 2011 Paul A. Dirmeyer Center for Ocean-Land-Atmosphere Studies Maryland. 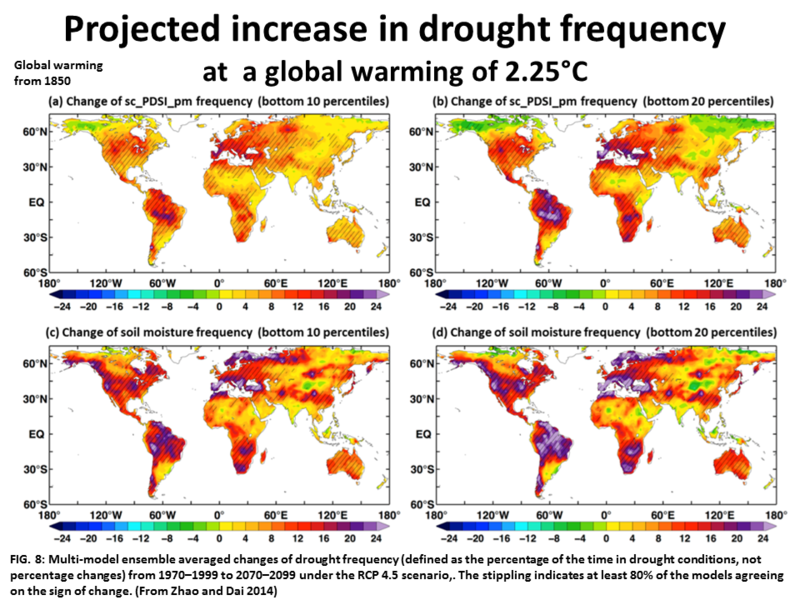 The extent of increasing drought extent over the past 50 years according to the PDSI is questioned by new research, though the projection of drought increase with global warming is not in question. 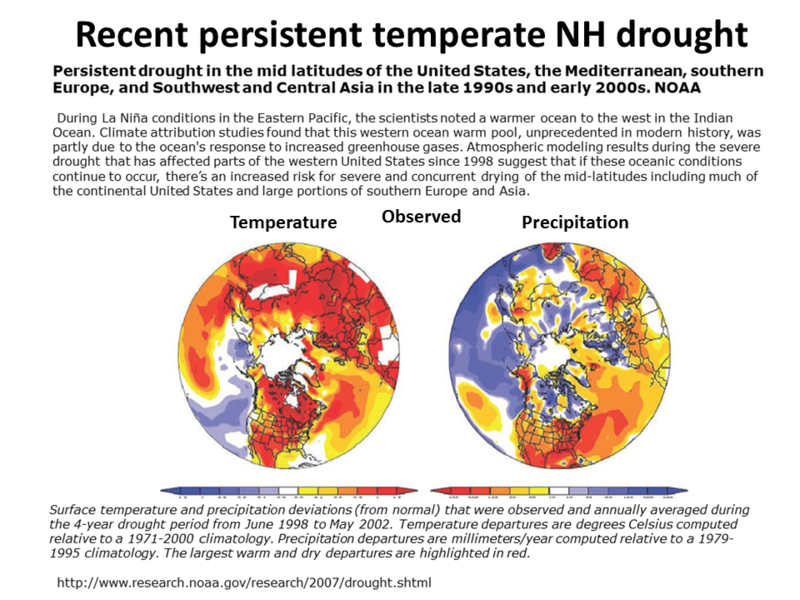 There ​​has been several very severe NH extreme heat - and drought events since 2000. 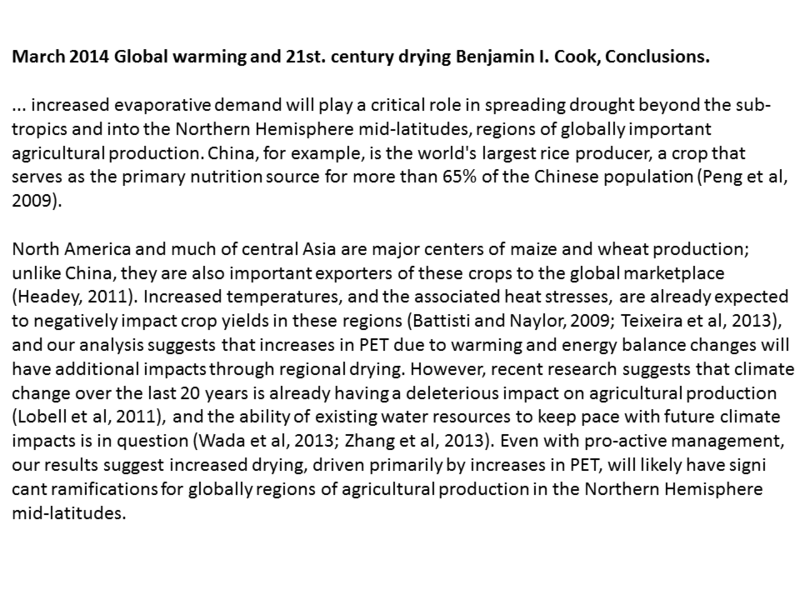 There is a long history of episodic severe and long lasting affecting all the world's best food producing regions. 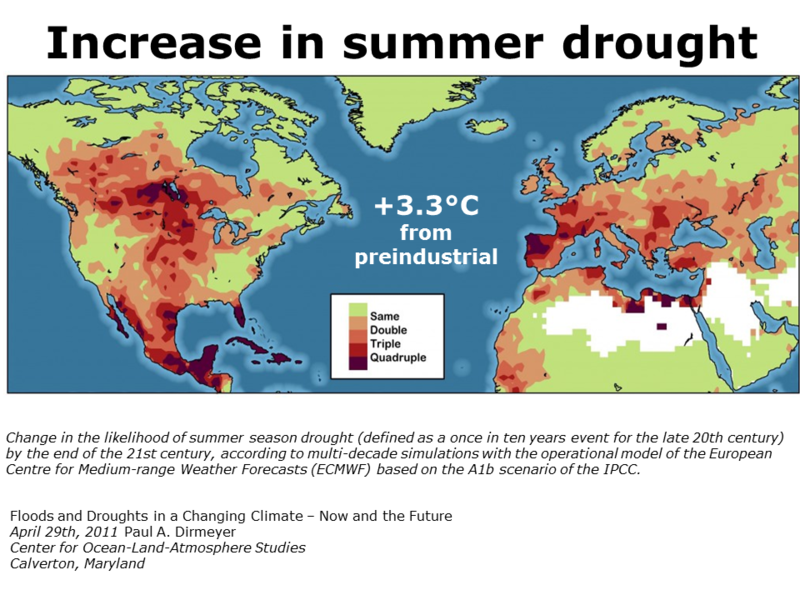 Experts at a 2009 WMO workshop agreed that global warming will greatly increase this natural tendency, with increasing heat waves and more drought damage to crops. 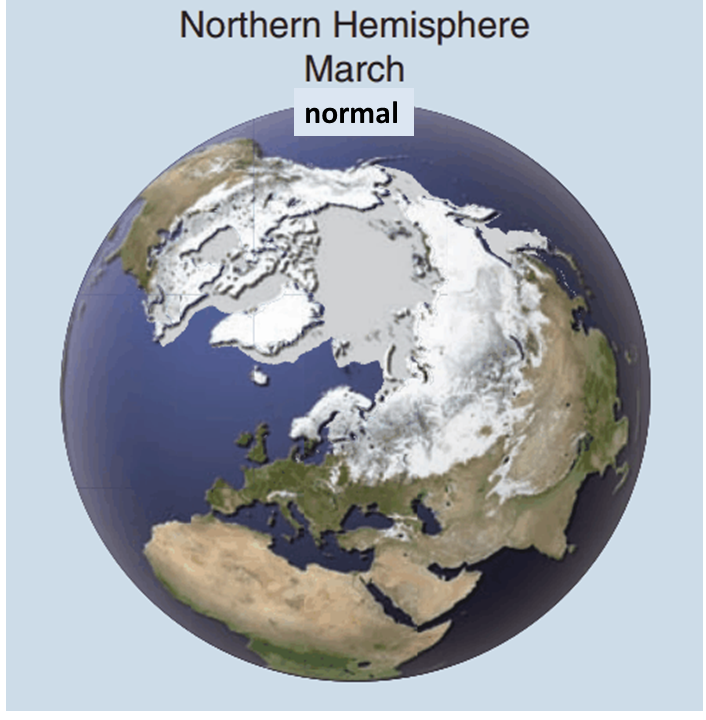 The loss of Arctic cooling albedo especially the snow will increase NH heat waves, drought and prolong these extremes. ​​July 2012 W. US projects drought crop losses. 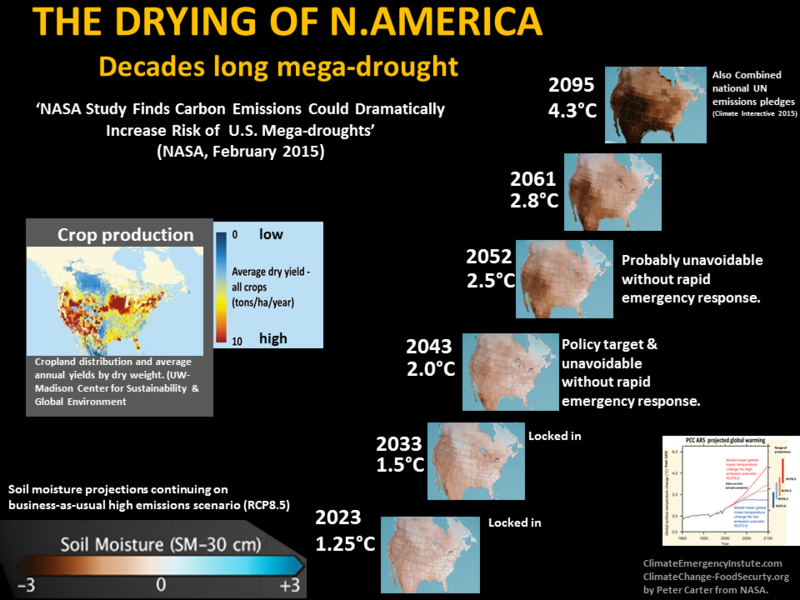 ​OF CIVILIZATION THREATENING MEGA-DROUGHTS HERE (USA) AND ABROAD. 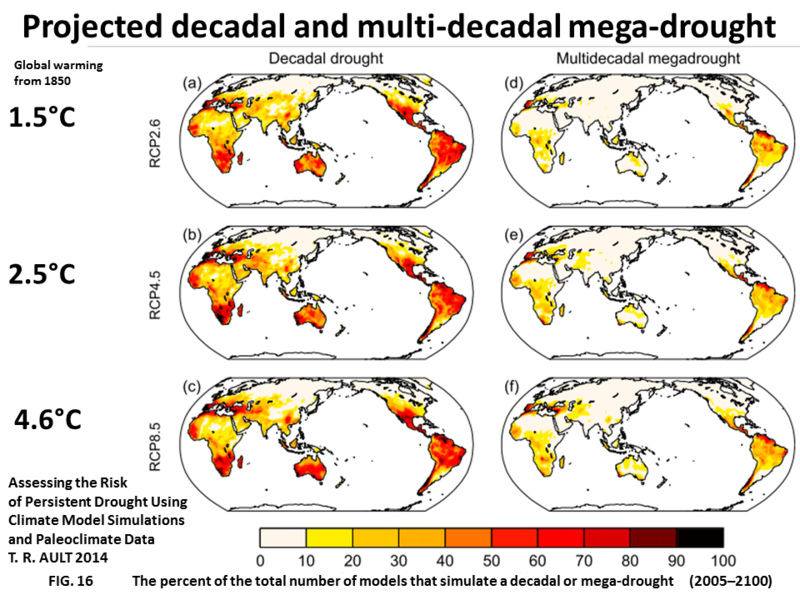 The 2015 N. America drought research confirms the extensive severe drought increase of A Dai's 2010 research that increasing	drought could affect much of the world within decades. 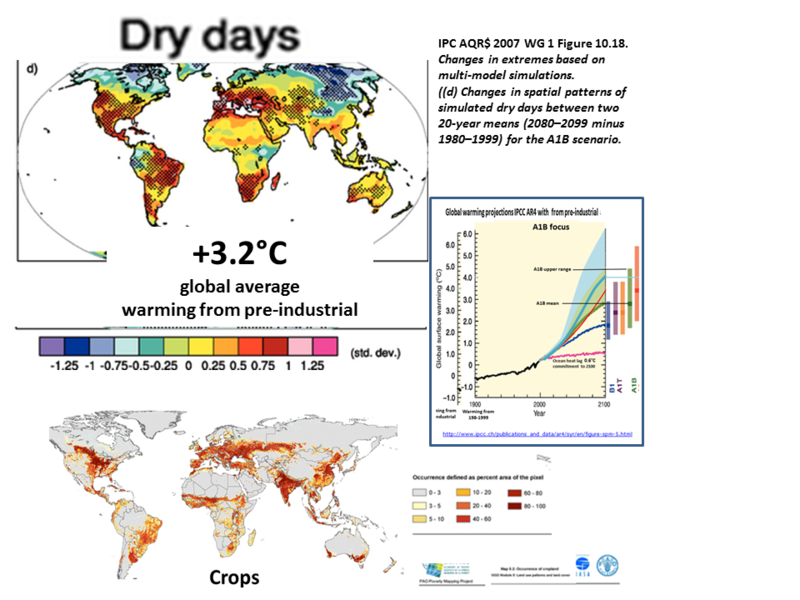 Under the 2C policy target most of the world will suffer severe drought, with decade long drought for some major food producing regions,and mega-droughts for a few regions. 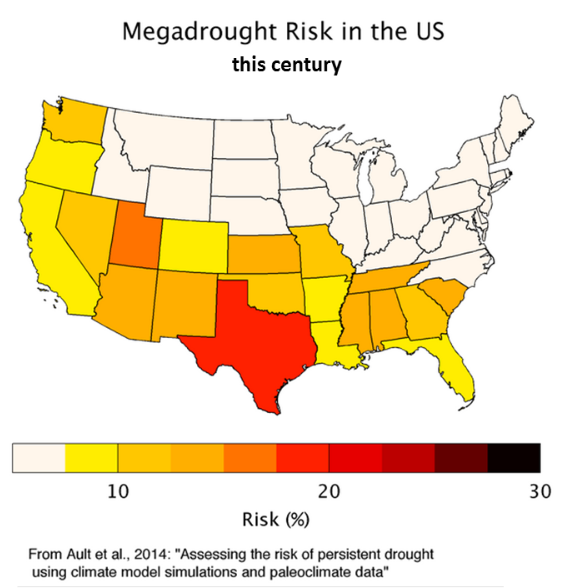 ​show risk of U.S. "megadrought"
​in the US and other crucial regions. 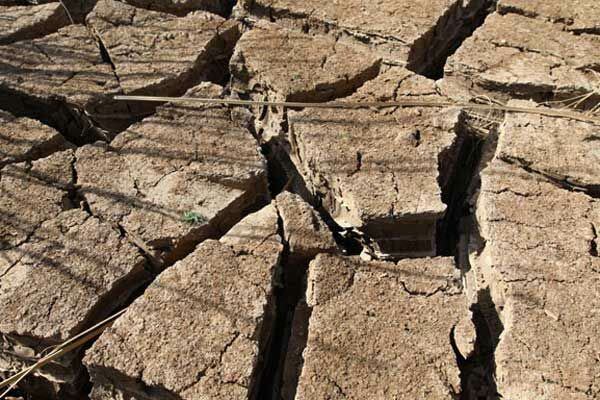 March 2015 ​Increases in atmospheric CO2 could intensify extreme droughts in tropical and subtropical regions—such as Australia, the southwest and central United States, and southern Amazonia—at much a faster rate than previously anticipated. 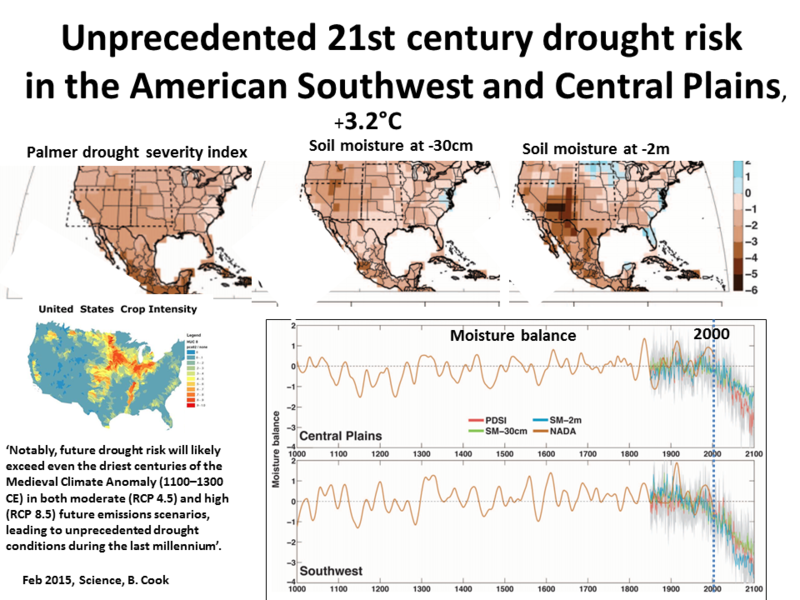 Feb 2015 ​Unprecedented 21st century drought risk in the American Southwest and Central Plains. 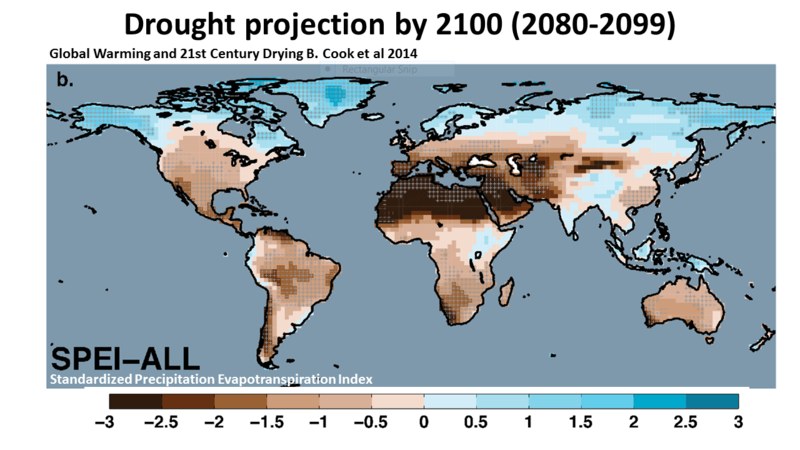 ​Drought is increasing regionally with climate change from records and now satellite data. 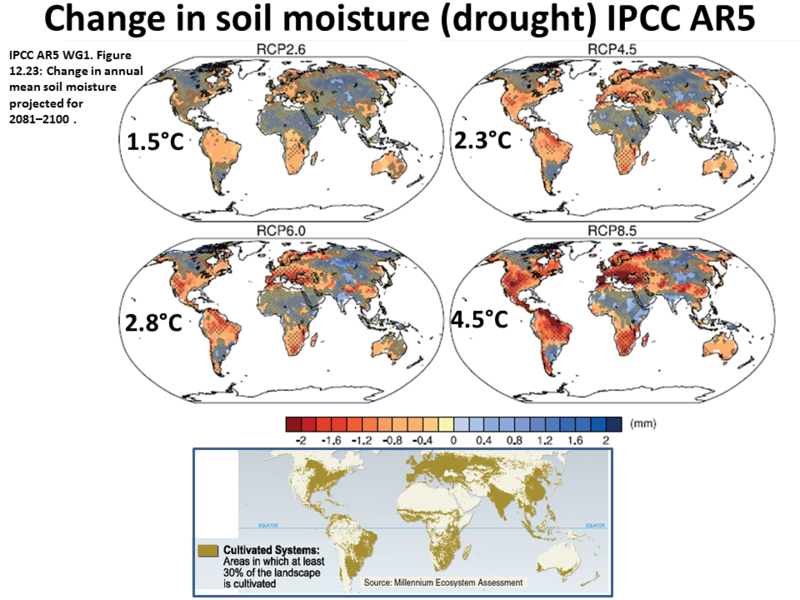 The 2014 IPCC AR5 reports increasing regional drought,which will continue. ​the Mediterranean, southern Africa, and the Amazon'. 24 Oct 2017 World Bank Uncharted Waters...21st century collision of two powerful trends—rising populations coupled with a changing climate. With population growth, the demand for water is growing exponentially while climate change is making rainfall more erratic and less predictable. 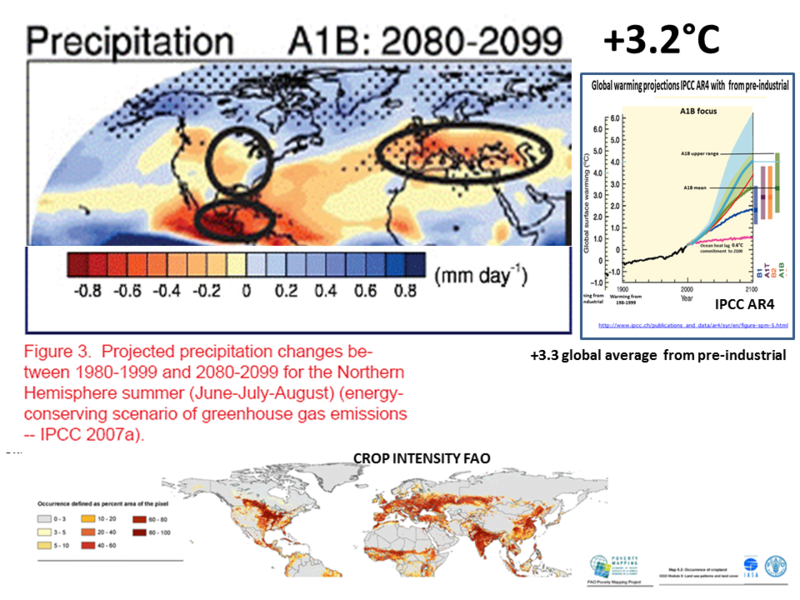 With climate change,... longer and deeper periods of droughts and deluges. Impacts are deep cascading and long lasting.